It is important for most men to set themselves apart from the crowd instead of being part of the greater herd. Even though there are many ways to express their uniqueness, accessorizing in a certain way speaks out to everyone more than other things. Chains, rings and bracelets have become part of the accessories that are increasingly being bought today. 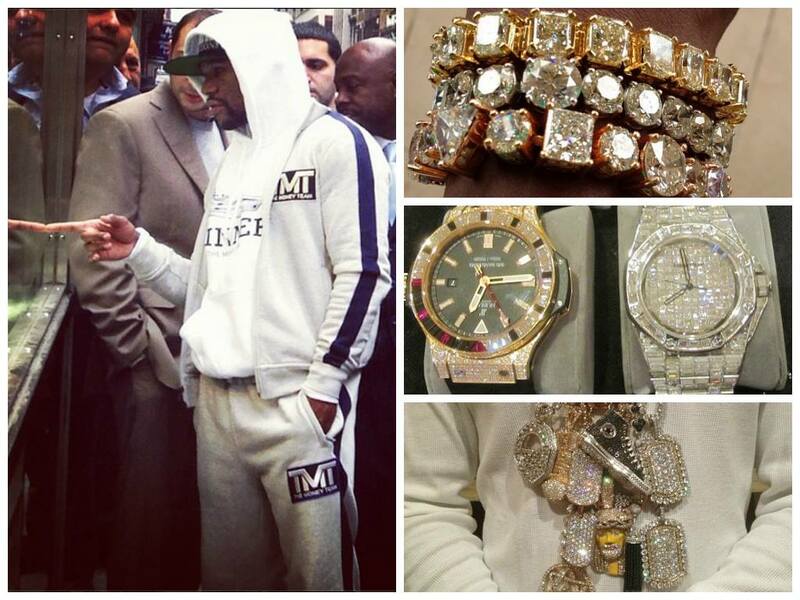 This can be testified by the image of Floyd Mayweather shopping for jewelry. Known as an American boxing star and a renowned personality, Mayweather believes accessorizing to be a way of self expression. Out of the many jewelry options available, men’s gold bracelets have been quite the ‘it’ accessory since many decades. Gold has not only become a status symbol, but also showcases fine taste and power in some cases. Also, bracelets are preferred over other form of men’s jewelry because they look highly masculine if designed properly and go with all body types. Men’s gold bracelets have evolved over the years and are now available in quite a lot of designs to satisfy the growing fashion needs of all the men out there. Instead of just plain bracelets, men can choose from Heavy Miami Link, Miami Cuban Link, CZ Jesus Head, Semi Hollow, Rope, Franco, Figaro and many more. Other than the design, a palette of colors is also available for a better distinguishing factor. While traditional yellow gold might speak volumes of style and heritage, white, rose and black are also classy colors that would go perfectly with all sorts of dressing styles. Men who want a bit more originality can always opt for the two-toned bracelets that are surely to become quite the talk of the party. The most important part of bracelet shopping is to draw up a budget that would complement the pocket size of the individual wishing to make the purchase. The quality and weight should be decided upon before the order is placed. While 24 karat gold may seem highly appealing, it is important to note that high quality gold is softer and therefore more prone to damage. Among the countless businesses that provide jewelry and accessories to the fashionable men of New York, TraxNYC is one that has made up its reputation as one that always delivers on its promises to customers. It offers the utmost power to its clients by producing custom-made jewelry according to each individual’s needs and wanted designs. The specialized equipment used by the company ensures flawless items that can be worn with pride and confidence. TraxNYC’s clientele also holds the names of many celebrities. For more information on men’s gold bracelets, click here.